Starting life as a series of Lord Of The Rings-type mythical novels, The Chronicles Of Prydain by Lloyd Alexander, the source material must have at first seemed like fine pickings for a then new-age Disney feature. Walt’s “Nine Old Men” had mostly laid their animators’ pencils down for good, with only Eric Larson staying on in a supervisory capacity. On and off the boil for over ten years, The Black Cauldron finally began to take shape in the late 1970s. Chosen as a way to take Disney Animation in a new direction after a raft of “What would Walt do?” movies following The Jungle Book, Cauldron’s dark edge was to continue the more mature streak that had begun with The Rescuers and would continue through The Fox And The Hound. However, it was a casualty of many different factors from the start: an unwieldy book difficult to translate adequately to film, the walkout by a renegade group of animators led by Don Bluth which slowed production down, and the takeover attempt of the Disney Studios in 1984. The company fought back, securing the services of, and installing Michael Eisner and Jeffrey Katzenberg to run the rejuvenated Studio. Katzenberg and Walt’s nephew Roy E Disney looked at what footage had been assembled and completed on The Black Cauldron project that they had inherited, and were shocked. Despite having many exceptional animation special effects, including some simply amazing light and shadow work from the days before CGI, the film was apparently a mess! Katzenberg resorted to doing what no other studio executive had ever done with an animated film. He began to re-cut it. By the very process of making them, animated films are produced “back to front”. After a script or outline treatment has been written, storyboards are cut together to aid the visual telling of the film and to develop pacing and story structuring. It’s rare, for example on an animation DVD’s deleted scenes section, to find fully completed and finalized footage which has been cut at such a late stage from the film that it would be fully colored. These sequences are usually trimmed or revised during the production process, most often long before principal animation begins. Sometimes, of course, it’s not until the entire film is finished that a small sequence may be switched or deleted (Pocahontas and Atlantis: The Lost Empire specifically both had completed scenes changed last minute). But here was Katzenberg, actually going in with the scissors and cutting the film as if it was a live-action picture – losing a rumored 12 minutes-plus of completed, and expensive, finalized ink-and-painted animation! Even with his cuts and revised chronology, The Black Cauldron still feels very episodic in nature, and as I remembered it, could be a drag to get through. On the other hand, it has always and continues to remain a visual spectacular…a daring leap in tone for Disney to have attempted at that time, and still a very unique title in their ever-growing library of traditionally animated films. Though it deals with epic themes and truly nasty characters, when Disney has made mention of this film (it’s number 25 on their list) over the years, it’s always the secondary “cute” sidekick characters that get promoted over the film’s nominal hero, Taran, and his on-off companion, Princess Eilonwy, one of the only true princesses in Disney’s canon, but one they never now mention in their merchandising lines (I guess their “out” is an added line of dialogue that suggests she is simply a “scullery maid”, but she’s of royal blood in the Prydain books). But why bother with the boring humans, they must surmise, when they have Gurgi to promote, being a small animal seemingly made of fluff (and somewhat resembling Gepetto from Pinocchio)? 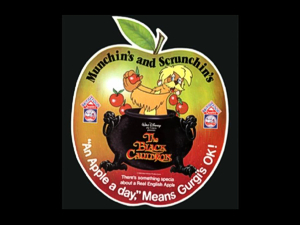 He’s usually the character pushed most in the promotion for The Black Cauldron (his “munchings and crunchings” line used in much advertising), and it’s interesting to see how the Studio continues to try and pitch the film to viewers as a warm-and-cuddly fantasy. It was re-issued (albeit very briefly) as Taran And The Magic Cauldron, but would have probably made more money if they’d stuck to the original moniker and let people discover it out of curiosity. Now, with a fairly good cover depiction, that may be the case, since The Black Cauldron finally looks like the sword and sorcery epic it was intended to be. Whether the actual film works on this level continues to be open to debate, and there are plenty of people who would persist to call it Disney’s biggest dog, incorrectly, as it happens: Cauldron actually recouped its investment and turned a modest profit, and remains a film much talked about long after similarly vintage fare, such as Krull and the like, have been forgotten, and I’ll bet there’s more of an audience for the film long after the likes of Chicken Little has been forgotten too. Yes, it does belong to a different era, when maturity was mistaken as simply producing darker movies by the Disney Studios. The Black Hole, Watcher In The Woods, even the Witch Mountain movies and The Rescuers had put Disney on a path to edgy family fare (the “edge” being misplaced) in an attempt to appear grown up and contemporary (this after being among the studios to turn down Star Wars and Back To The Future). But apart from the tonal shift from singing forest animals to man-burning fire dragons and a truly terrifying villain that raises the dead and eventually meets his fate in perhaps the most shocking Disney moment ever, The Black Cauldron also has much to recommend it – including those man-burning fire dragons and a truly terrifying villain that meets his fate in perhaps the most shocking Disney moment ever! It’s true that there are certain scenes of some tired draughtsmanship, where the animation looks laboured and directionless (the result of its troubled production under at least two different crews). Other scenes show up the overly ambitious nature of the project itself. However, when it works, it works well, and despite its shortcomings, The Black Cauldron plays well to the animation and sci-fi fan, even if they may be bemused by the plot and scoff at its antiquity. In the voice cast, there’s not much to get excited about if you’re into your celebrity voices; to its credit The Black Cauldron sticks to vocalists who are instead right for their roles. The leads do their job admirably, but they are sometimes lumbered with the most unconvincing dialog, and in particular, Grant Bardsley’s Taran comes off worst. Otherwise Nigel Hawthorne makes his first appearance in a Disney feature (he would go on to voice Jane’s father in 1999’s Tarzan), and some may mistake Arthur Malet’s fairfolk King for Douglas Seale’s Sultan from Aladdin since both sport the same intonation. Most impressive is Watership Down’s Hazel, John Hurt, as the Horned King himself, bringing much gravitas to his role and providing the spine chills when the animation can’t quite bring itself to be as deadly as his vocal reading suggests. The rest of the characters are a mixture of old and new, with the Horned King’s aid Creeper particularly memorable (a glimpse of what was to come with The Great Mouse Detective’s Fidget and, perhaps, the inspiration for Hercules’ Pain and Panic? ), but otherwise, pretty standard designs for this type of fare. 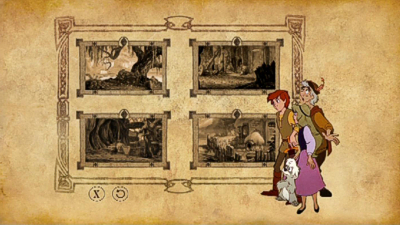 The animation itself was the first time the new breed could really show off: The Rescuers having been supervised by the last remaining Nine Old Men, and The Fox And The Hound being the final handover picture. Here they’re allowed free reign, and amongst the talents are future lead and directing animators Andreas Deja, Phil Nibblelink, Mark Henn, Barry Cook, and Mark Dindal. Not credited, but involved in production was a young Tim Burton, who was also directing his first short, Vincent, at the Studio and was about to unleash Frankenweenie, who provided concept artwork (to this and Return To Oz), which has sadly never much been seen. Way down the Black Cauldron crew list is production manager Don Hahn – now of course one of the most acclaimed producers at the Mouse House – and inbetween effects artists Rob Minkoff and Gary Trousdale, both now directors in their own rights! Despite the new generation, the legacy of their CalArts/Disney education is clear: it’s not at all tricky to pick out their influences throughout The Black Cauldron even as they attempt to add some dimension to the Studio formula. Thus Eilonwy is a classic princess in the Snow White style, and Taran isn’t so far removed from being a teenaged Mowgli on his way to becoming a dashing prince type, while Gurgi’s resemblance to Gepetto has been made, and Creeper could have stepped out from Maleficent’s army of goblins and trolls. The design harks back to classic Disney, too: the forest could have been where Bambi frolicked, or indeed where Snow White met the Dwarfs, with Black Cauldron itself inspiring the television series Adventures Of The Gummi Bears, sharing design similarities and even character makeovers in the show that debuted just a year later and took a lighter approach to the same type of material, adding greater elements of adventure and comedy. So The Black Cauldron isn’t exactly your typical Disney fare, but to those that appreciate what progress has been made at the Studio over time, or those who bemoan the lack of non-musical films (there’s not one song amongst Elmer Bernstein’s massive score), there’s much to recommend. If nothing else, Cauldron is that important watershed moment in Disney Animation where the old era was well and truly over, and the new age was ready to begin. It may have been the expensive bump that got the company to sit up, look at what it was doing and get back to basics, but frankly, it’s a film that doesn’t warrant the reputation it has acquired, rightly or wrongly, and has been assigned to it by its producing Studio. With a bit more care, perhaps others might see that it’s actually a title that, while probably not in danger of being regarded greatly among the annuls of the fantasy genre, easily earns its place in line along with the other mythical special effects blockbusters of the early 80s: Clash Of The Titans, The Dark Crystal and The NeverEnding Story among them. 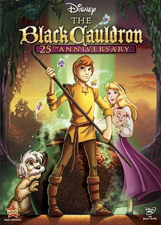 Ultimately much more successful than Ralph Bakshi’s Lord Of The Rings, to pick another of that era’s similar offerings, and really the only title to compare in animation terms, The Black Cauldron showed what the new generation of Disney artists wanted to attempt, and the then-limits of their ambitions. It pushed the boundaries of animation, with scenes displaying depth and perspective, and indeed does contain the first uses of computer assisted animation in a Disney animated film, something that the Studio wasn’t that quick to promote, presumably after the lack of enthusiasm for Tron. Like that film, Cauldron was perhaps hampered with its eventual PG rating (perhaps not only for its dark imagery, but also a questionable gag involving a frog and one of the Witches’ cleavage! 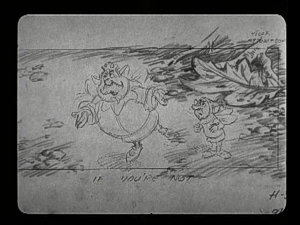 ), though it was not, as commonly believed, the first Disney picture to be rated with a PG certificate. That “honor” went to the 1933 black-and-white Mickey Mouse short The Mad Scientist, a truly creepy affair that would have been a nice companion piece to include on this disc. 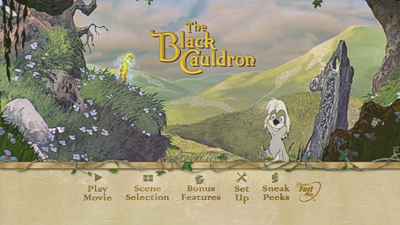 Cauldron was the first animated Disney feature to pick up the rating (it was actually cut twice to avoid PG-13 and R ratings), and the Studio certainly seemed to think that played a part in its box-office fortunes – the following year’s Mouse Detective would see a much lighter and successful addition to the Disney library, itself born out of Cauldron’s tangled production. And not only would mouse ’tec Basil find himself up against a twisted Professor Ratigan, but there was another mouse on the block: Spielberg and Bluth’s Fievel, star of their competing An American Tail. The stakes in animation were about to get much higher and Disney could no longer afford big-budget mis-fires like Cauldron. In 1985, I was in the right place and at the right age to submerge myself in these kinds of spellbinding adventures, even if I now find myself agreeing with the critics of the time in that those films were ultimately too adult for children and too juvenile for adults, hence their routine box-office failure. But if there’s one picture that has stood up pretty well, and deserves to be reappraised in the way Titans or Crystal has been in recent times, it’s The Black Cauldron, which remains, for me, apart from that pack, perhaps as it has not been as easily accessible and seen as often. It would not, and probably could not, be made under today’s animation “rules”, but it would have been great to see what the Disney of today could have done with this material. As it is, The Black Cauldron was possibly the last time the Studio really took a blind leap of faith to gamble on something totally original and atypical to the “Disney brand” (even Hunchback managed to crowbar in some comedy gargoyles), although interestingly, and long before Pirates Of The Caribbean pulled the same trick, Cauldron dispenses with a “Disney Presents” credit at the beginning). With this new edition looking as clean as it does, and taking the film’s not always successful experiments on the chin, it at least seems to keep getting better with each viewing. This is the second time around for The Black Cauldron on DVD, after it never made it to LaserDisc and we had to wait until 2000’s announcement of Disney’s Gold Collection titles, when the movie was a surprise addition to the line and actually arrived not only with a new Dolby 5.1 mix but in its originally intended widescreen ratio to boot. But that was about as excited as we could get: despite the capabilities of the format, there was no talk of the production’s issues, of any alternate versions, of Katzenberg’s cutting, and certainly no suggestion of an extended cut or deleted scenes. In my review of that edition, I suggested that, “perhaps someday Disney will return to this title and give us an all-encompassing edition, featuring this final cut, a documentary on the film’s making and re-editing, and an original in-progress work-print, showing what was cut and how the story was re-arranged”. Alas, that still doesn’t appear to be on the cards any time soon and, like the rest of Disney’s other recent Special Edition upgrades, there’s only very little added (and as usual some taken away), and in this day where Blu-ray is becoming the format of choice, it’s frustrating that the new digital print isn’t even available on anything other than a standard definition disc! However, at least this time, there’s a peek at what was cut, even if the single new extra of worth doesn’t present the plural deleted scenes that were originally promised. As a FastPlay disc, the usual collection of Sneak Peeks are teed up first, and these include a generic Blu-ray promo, Tinker Bell And The Great Fairy Rescue, Beauty And The Beast, Tangled’s no-title teaser, Disney’s Movie Rewards program, Disneynature’s Oceans and The Crimson Wing, Prince Of Persia: The Sands Of Time, A Christmas Carol and the D23 fan community, though these play as a long loop and are not selectable from their own menu as on past Disney DVDs (perhaps a cost-cutting exercise as more focus is spent on Blu-ray production). From the previous Gold DVD, the Quest For The Black Cauldron game is a now antiquated Disney film-based trivia trip of the very old kind that carries us through the lands of The Black Cauldron. Still the most interesting about this feature is the inclusion of some brief clips from the film presented full-frame and offering the chance to see how the film would look had it been pan-and-scanned – ugh! 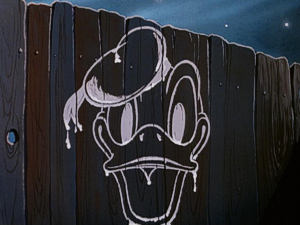 Also from the Gold disc is the inclusion of the 1952 Donald Duck short Trick Or Treat, a comical escapade in which Donald must outwit his three nephews on Halloween night. Unknown to him, Huey, Dewey and Louie have enlisted the help of a bona-fide Witch! It’s a fun short, featuring great gags, a catchy theme tune and a seemingly higher budget than some of the other shorts produced around this time, though this seems to be the same unrestored print as before (not too bad in shape), and I could think of some more appropriate Cauldron parings than this. New to this release is another game (um, yay? ), here labeled The Witches’ Challenge Game. It’s better than the Quest, but not by much, being overly convoluted and ultimately pointless (plus I kept forgetting what the riddle questions were and ended up just pointing my cursor at any and all items, becoming increasingly frustrated). Other than that, the only other new thing here is that single Deleted Scene, The Fairfolk, which even gets its own mention on the front sticker. Disney knows we want to see more like this, so maybe it’ll be the selling point for the eventual Blu-ray, if a few more can be added to the mix. Much anticipated, the moment is special in that it presents almost an additional ten minutes of footage, though inevitably somewhat disappointing in that it was obviously cut for being uneventful and full of filler material, even if this does offer up a completely different take on the sequence. As well as explaining that Eilonwy’s magic orb didn’t always disappear for a great chunk of the film, there is some great animation here, with alternate designs for the King and Doli, along with a design concept that would be reworked for Aladdin’s Cave Of Wonders. That it isn’t fully animated, being a mix of storyboard and pencil test, is intriguing (I’d still love to see the juicy graphic moments cut to avoid an R rating), but it’s been nicely tied together with original and re-recorded voices and Bernstein’s music. Unsurprisingly for a Disney reissue, there’ll be a decent feature removed from the old edition, and the original theatrical trailer is the casualty, a shame since the mix of Hurt’s “Soon the Black Cauldron will be miiiine” and Bernstein’s score on the soundtrack always sent a tingle down my spine. More satisfactory is the retention of the pretty extensive still-frame gallery. Split into seven separate sections, covering Visual Development, Character Design, Behind The Scenes, Voice Talent, Layouts and Backgrounds, Promotion and Tokyo Disneyland (the film’s attraction in Japan), the gallery features over 100 stills of concept art and production photos. A look at different poster campaigns (including the “Magic Cauldron” re-issue) is included and provides a welcome chance to see alternative concepts, and I’m pleased to say I still have my own copy of the Gurgi apple promotion that features what I still believe to be the best logo interpretation for the film. When first released back in the dark days of VHS, Disney’s marketing department went into full fantasy swing and the sleeve featured Taran, Princess Eilonwy, Gurgi and Hen Wen, all in the magical purple glow of the family-friendly Cauldron – ahhh, lovely! The international sleeve reflected the more ominous tone and nature of the movie itself, with its dark blues and deep black Cauldron, but still Taran was flanked by Gurgi and the gang. Ultimately, Cauldron has been a tough one to sell in one image, with only one or two of the original posters reaching anywhere near the dark and decidedly non-traditional PG-rated nature of the film. After the lacklustre Gold disc, we finally seem to have at least got a little closer to the truth with this 25th Anniversary Edition in color styling, even if the elements still go for the adventure rather than the supernatural. Thus the Cauldron itself is relegated to the background, with Eilonwy and Hen Wen again on the sidelines, leaving Gurgi quite prominent alongside Taran, here posed heroically except for brandishing a wooden staff (not in the film) as opposed to his magically powered sword. An emerald glow represents the forces of the Cauldron, but it’s a bit heavily applied to Taran’s hair and makes him look like he has green tints! The back of the sleeve indicates little more, with most of the characters – even Creeper – looking lovable and smiling, though there is the Horned King in the background looking more like Skeletor than anything. The disc art is the Studio’s now regular boring gray, but the title treatment is more appropriate than before, and all that’s housed in the black keepcase is a Movie Rewards insert code. If ever a Disney reissue needed a deluxe slipcover to big-up the contents of a disc and make a film more attractive on the shelf, it’s this one, where the front art would look pretty stunning on an embossed, foiled slip. You’ve probably already guessed, then, that Cauldron doesn’t seem to warrant that treatment, which is a shame. Back on the original Gold Collection review, I commented that Disney wasn’t likely to spend a good few thousand dollars making The Black Cauldron look brand spanking new, but lo and behold they (almost) have done. Presented again in its intended 2.35:1 aspect, but this time anamorphically enhanced and spruced up by a digital wash, this edition replicates the deep transfer I first caught on that TV broadcast some time ago. Naturally, a Blu-ray would be most welcome, and I could see that this would be a rare time when the added clarity would really show off those amazingly lush backgrounds, but this is still pretty good going. Cauldron was the first animated film since 1959’s Sleeping Beauty to use a full 70mm frame, which became one of the film’s unique aspects and saving graces. The backgrounds are among some of the finest detailed in Disney animation and mark a change from the purposely stylised (but sometimes bland) layouts of the 60s and 70s to a return to the fully rounded approach inherent from Snow White and Bambi. The widescreen framing lets all these magnificent paintings be seen again, and the transfer is wonderful, lacking the gate weave and fluctuations of the past (except for the supposedly unworthy end credits) and leaving any imperfections to the technical limitations of the film’s vintage. But the grain is fine, and retains a nice texture without ever interfering, being an honest film transfer and not one scrubbed digitally clean, though there’s not a mark on it. Being honest, I can only say that this has the potential to look stunning on Blu-ray. As excellent as the image is, the soundtrack sounds brand new too. For years, fans waited to hear Elmer Bernstein’s score pumping out of all 5.1 channels of their speaker system set up, and the original Gold disc delivered, but this one beats even that. Dialogue sounds crisper, and the score envelopes the viewer, though more than likely this is just a less compressed mix from the original 70mm six-track masters. By no means is this a reference standard track, nor is it as aggressive as today’s mixes, but the audio certainly packs a punch in specific scenes, ranging in dynamics from the strong (the flying dragon attack) and the bold (the Horned King’s explosive climax), to the soft and wispy (most of the quiet dialog only moments). Bernstein’s score is typically in keeping with this type of movie – big and bombastic, with a little “local” color to keep things rooted in “reality”, but like the film it often comes at you from some strange directions. There are one or two themes that stay with you, including one point in the film, where Taran and Princess Eilonwy resolve their argument in the forest, which sounds like it may have led into a song moment and could have been interesting… Sadly, the only way to hear the full cues are via bootleg edition CDs, which I don’t condone but suggest that Disney should release an official disc, perhaps through the great folks at FSM, who have been dealing with other Studio scores of the time. If the only way to get our hands on material that we really want is through the bootleggers, the studios only have themselves to blame, and though it’s often an odd score, it’s an interesting departure from the usual Disney sound. My only gripe technically is at the layer changes, which hacks off the end of a musical note when it could have been placed just a couple of minutes earlier during a silent fade-out. As on the previous disc, French and Spanish viewers get good dubbed versions, but now they’re in Dolby 5.1 Surround, while all three languages are also offered via subtitles. I can’t come right out and say that The Black Cauldron is one of my favorite Disney movies – the final result is still a little too disjointed for that – but there’s no doubt that it’s an remarkable film that tries a vastly different approach and ends up being something quite fascinating in its own right. Animation aficionados have probably been able to catch up with it via the Gold Collection release (and it is worth catching up with), but it’s well worth another revisit, even if the safe bet is to wait on an inevitable Blu-ray release (these HD remasters are not done for nothing, you know). As for everyone else, the younger set should be enthralled by its epic scope, entertained by its imagination and sidekicks, and just that little bit scared helpless by the villain and his cohorts – just like all those classic Disney movies of old! This 25th Anniversary is mostly a wasted opportunity to explore and redeem the film, especially when other films of the same era (Legend, for example), made great play of their production histories and packed much in. A commentary and documentary would be a must, along with an original workprint version – not every film can be a Snow White or Beauty And The Beast, but often those films deserve more in the way of explorations into why they turned out the way they did. As such, this new edition offers a much better transfer over the old letterboxed print, but that’s about it, the deleted scene being an extremely interesting but ultimately subdued attempt to include something we haven’t seen before. At least they didn’t try and stiff us on the price: under $20 is a pretty good deal, even if this particular version is probably only worth of a rental at best.